Canola harvested at 15-20% moisture can be dried to a safe storage level given the use of hot air drying or supplemental heat but it should be done immediately after harvest as damp canola is at very high risk for spoilage. Even if temperatures are cold at harvest, spoilage can happen quickly with any spike in outside temperatures. 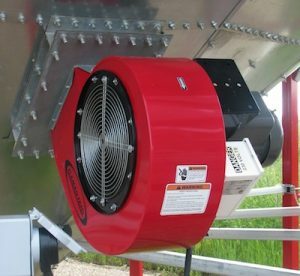 When using a dryer, the recommendation is to remove no more than five percentage points of moisture per cycle, so canola above 15% moisture will required two runs through the dryer. Given how long it can take to dry canola to that extent, farmers may need a harvest plan to manage the drying process as the combines and trucks are rolling. Make sure damp canola (like all canola) goes on aeration immediately after harvest while waiting for the dryer. Farmers putting damp canola into bags, note that this is a high risk situation especially given the likelihood that warm days, which can quickly warm up canola at the edge of the bag, are still possible before winter. 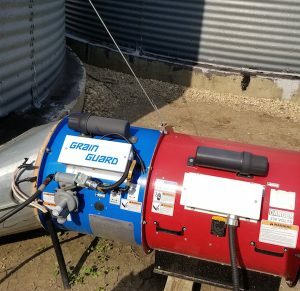 Read more on bag storage of canola.